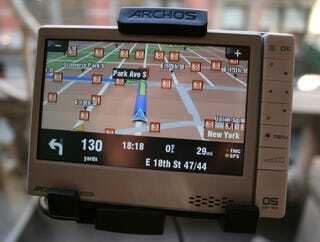 The car-mount GPS add-on for the Archos 605 turns it into a pretty basic GPS device. It's not meant to outclass offerings from Garmin or TomTom—hence they're downplaying the issue that it's not portable at all—but add some value to the 605. Maps are pre-loaded, but updates will cost you when they're offered. Response was a bit sluggish for my taste, but for a $140 GPS setup (if you've already got an Archos), it's not bad at all. One problem: If the cable comes out, GPS goes down, since the function is activated by the mount.